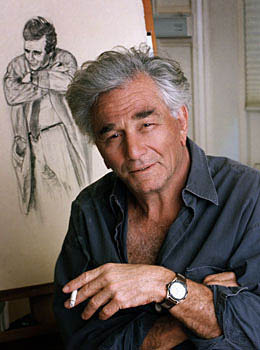 TV icon Peter Falk, best known for his role in the series “Columbo” has died of Alzheimer’s at age 83. He died on June 23,at home, in Beverly Hills, California, according to a statement released on Friday by Larry Larson, who is a family friend. Peter Fak has been diagnosed with the most common form of dementia, Azheimer’s disease, in 2009. His personal physician had reported back then that Falk had slipped into dementia after a series of dental surgeries he had suffered in 2007. Dr. Stephen Read stated that is was not clear what the factors in the operation that triggered the illness were. It could have been the anesthetics or something else. The actor’s mental condition worsen over time. Read said that at one point he couldn’t even remember the character that made him famous, detective Columbo. Today we lost someone who is very special and dear to my heart. Not only a wonderful actor but a very great friend, Gena Rowlands said. She co-starred with Falk in the movie “Woman Under The Influence” in 1974. The best way to remember Peter Falk is to celebrate his life and his great work. One of my all time favorite characters. Hated it when Columbo was taken off the air. You gave us some great memories, Mr. Falk. So sorry to hear about Peter Falks Death he will be sadly missed by many. He was a wonderful actor an all time great. He brought the character Columo and any other character to life.My Mother suffered from this disease it is horrible, my mum aged 80 died from pnumonia in the end peacefully in her sleep, before the disease got so bad that she could not remember me her son I am greatful she went the way she did. My heart goes out to his family and friends he was a lovelly lovelly man. God bless and R.I.P. Peter Falk, “Columbo” always caught his suspect off guard with his shabby appearance old Volvo and basset hound, by the time they realised he was very shrewd and onto them, he had them half nailed to the wall….he was a legend. Leading us on many a very clever and interesting adventure while he gradually ground down his suspect who he always worked out early on in the episode. When there was a star involved as the suspect, he always said Mrs. Columbo (who we never did get to see) was a fan. there was something very special about this man a sad day. Peter Falk was a truly gifted actor. He gave me endless hours of enjoyment watching COLUMBO.. I also thought he was great in THE IN LAWS. I am sorry to hear of his passing. I will remember him always as I watch him in. Columbo.